Killer Characters: Is There a Grinch in Rudolph? Is There a Grinch in Rudolph? Another year has passed. Goodness but time flies. Tomorrow is Halloween, and Thanksgiving is just around the corner and then it will be Christmas. Christmas! How I love it. I love everything about the holiday season, from the weather (bright blue skies, fresh snow, crisp chilly air), to the food, the decorations, the gifts, and above all the sense of love and family. In my family, Christmas is extra special, because my dad is Santa Claus. Of course he’s not really Santa, I know that. But I sometimes do wonder. He seems to have this way of knowing what a person wants before they so much as say so. My dad’s name is Noel, because he was born on December 25th. My name is Merry, because, well, because my family loves Christmas, I guess. I am the proud owner of Mrs. Claus’s Treasures, on Jingle Bell Lane. I stock everything you need for holiday decorating, as well as gifts such as jewellery and a special line of toys. Many of my goods are things you won’t find anyplace else – handmade by local artisans. Everyone in Rudolph, New York, loves the holiday season. In fact, we love Christmas so much, we celebrate it all year round. We have two Santa Claus parades, the big one in December and a fun one for Christmas in July. This is definitely not a town for Grinches. Although I might have spoken too soon. Jack Olsen, owner of the Yuletide Inn, has taken ill and his son Gord has arrived from California to take over the business. It’s rumoured that Gord has some very un-Christmassy plans for the property (plans like a big box store and a budget chain hotel franchise). The townsfolk are not pleased, I can tell you. And my dad, Santa Claus himself, got into a public argument with Gord. Still, I’m confident everyone will calm down, and the true Christmas spirit of Rudolph will eventually dissuade Gord from his plans. Otherwise, can Rudolph survive with a Grinch in town? The second in the Year Round Christmas series, We Wish You A Murderous Christmas, will be released on November 1st. If you’d like to enter a draw to win a copy of the book, please leave a comment below with your email address so I can contact the winner. Contest closes November 3rd. US entries only, please. Anything written by Vicki Delany is awesome. brichardson0056(at)yahoo(dot)com. Except for the Hallmark movies and the cozy mysteries, year round Christmas would be pretty exhausting! And maybe get murderous. Love these covers and the idea of this series. Thanks for the giveaway. I agree with you, Grandma. But it's fun to pretend! I love Christmas. I enjoy picking the perfect present for each person. My husband is the perfect Grinch. He very seldom gets me a present. There is no joy for Connie. Some men are, aren't they? I am looking forward to returning to Rudolph! 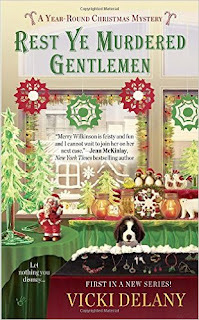 I so enjoyed the first one and can't wait to learn more about Merry and her family. Thanks! A cold, snowy day in MN and a terrific Christmas story to read - can't beat that! You sure can't. Mabye with a mug of hot chocolate? I'm ready for some good Christmas reading---as soon as I finish my Halloween reading. Thanks for the contest. Count me in! Awesome! Thanks for sharing your contest with Christmas books and I am ready. Can't wait to read "We Wish You a Murderous Christmas". Love reading a Christmas mystery around the holidays. Thanks for the chance. Love the idea of a town that celebrates Christmas year round. Thanks for the chance. It does sound like a good read. I loved the first in this series and would love to win the second. Thanks for the chance. What a fun subject! 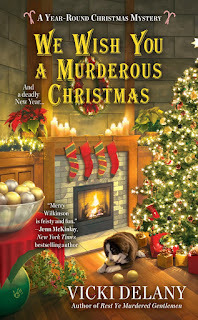 Christmas cozy mystery series. Can hardly wait to read!!!! Christmas is my favorite holiday!!! I love Christmas, so a Christmas-themed cozy is perfect! I know what I'll be reading the night before Christmas...ho, ho, ho! looking forward to reading this I loved the first one!!! thanks for the chance to win. 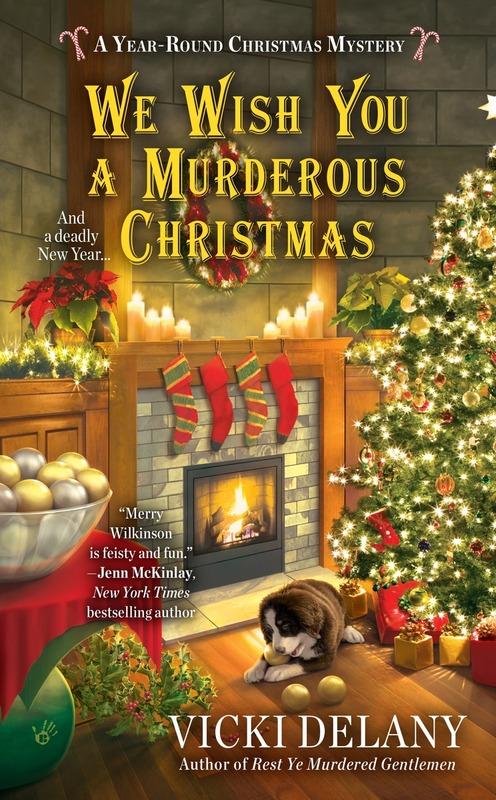 I love Christmas mysteries and this sounds like a captivating cozy I will enjoy. Thank you for this chance. I love Christmas and collect Christmas books even though my space is limited now and I mostly read ebooks. We Wish You a Murderous Christmas sounds perfect! Thanks, Billie. It is available on ebook formats.